I have a confession to make. 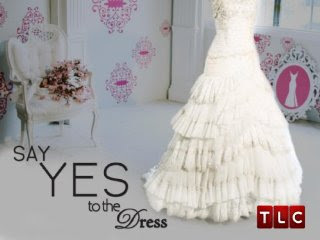 For the past three years, I have fostered a faintly unhealthy obsession with the TLC series, “Say ‘Yes’ to the Dress”. It hasn’t been an addiction that I’ve been able to satisfy very often, but I’ve been known to binge now and again. For anyone who has not seen the show, each episode follows a bride as she embarks on her quest for the perfect wedding gown. It is filled with lots of gorgeous dresses, some not-so-gorgeous gowns, and a handful of options that seriously make me question the sanity of our culture. 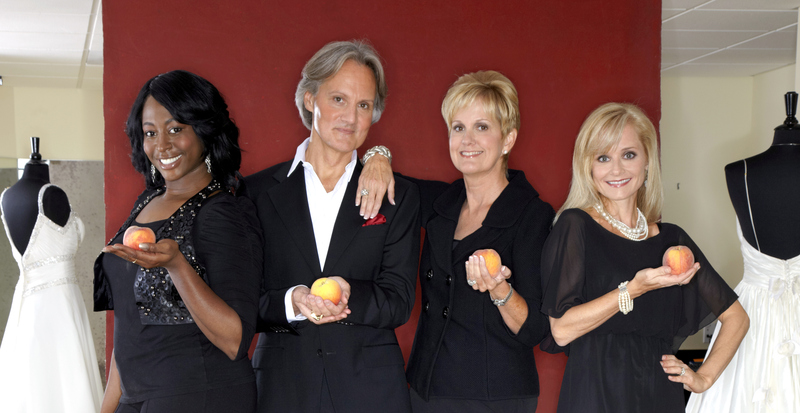 Even when I was in the convent, my sister and I spent several hours in front of the TV watching a “Say ‘Yes’ to the Dress” marathon when I came home for Christmas break. Even when I thought that I would never “say ‘yes’ to the dress,” I wanted to live vicariously through these brides. Even if I assumed that I wouldn’t get a white wedding gown (besides my habit), I enjoyed watching as other women searched for that perfect dress. Even though the purpose of each episode was exactly the same- get the soon-to-be bride to say ‘yes’ to a dress- the story line differed from episode to episode. This happened for a number of reasons- the bride’s personality, her family and friends’ personalities, their interactions with the consultants at the boutique. As a reality show, there was a solid dose of drama in each episode, but it normally wasn’t that difficult to look past the shenanigans to appreciate the gorgeous dresses that were featured in every episode. Though every bride was different, they all seemed to approach the adventure of finding their bridal gown the same way. They were on a quest to find “the one.” No, not their future spouse- they’d already found him (and sometimes he even came along for the ride- weird). They were looking for the perfect dress. Sometimes their desire seemed doomed right from the beginning- especially when the bride entered the wedding boutique with her exact dream gown already fashioned in her head. Already wrought perfectly in her imagination, there was no dress that could suitably meet her expectations. By the end of the episode, this type of bride generally said ‘yes’ to a dress only after lowering her unreasonable expectations. Unless she wanted to create her wedding dress herself, she would have to settle for something other than the very vivid image that she had in her head. But she wasn’t the only type of bride doomed to fail. Even though every episode ended with the bride saying ‘yes’ to her dress, only a few of them were outright victories. Why? Because despite the many differences from bride to bride, most of them had one thing in common: an underlying delusion. At the foundation of their quest, there was a lie. They had each been promised a dream that would most likely not come true. It is a lie that many young girls are fed from the moment that they are old enough to understand that they might one day get married. It is a myth that has very little grounding in reality. It is a hope that women would do well to abandon. As little girls, we were all told that when we put on the “right” wedding dress, we would know that it was the one. The proverbial fireworks would erupt, and somehow the world would change just a little bit in response to our discovery. We were told that we would know as soon as we put it on, or as soon as we laid eyes on it. Finding the perfect dress would be like some distorted form of love at first sight. Finding “your” dress would be like finding your soul mate- there can only be one, and when you found it, you intuitively know. It’s not true- at least not in most cases. For some girls, that promise would live up to the reality of their situation. I’ve met young women who tried on a single dress and immediately knew that it was the one. I’ve also known brides who had to try on hundreds of dresses before they found the one that they had dreamed of. Or else, they tried on hundreds of dresses before finally accepting the fact that there might not be the “perfect” dress. Freed from such a rigid constraint, they were finally able to review the handful of dresses that they had liked before choosing the one that they could best see themselves walking down the aisle in. I’ve met all sorts of brides, and I’ve heard horror stories as well as stories with fairy tale happy endings. But there is one thing that my experience, as well as my time watching “Say ‘Yes’ to the Dress,” has taught me: you might not have that “wow” moment when you’re looking for a wedding gown, and that’s perfectly acceptable. Not everyone does. This was something that I had heard before, but I never took the advice very seriously. I just assumed that I would be the type of bride that would see the dress hanging on the rack and know that it was meant to be mine. If I had paid better attention to those wise words, my own experience of dress shopping might have been a little different. But that’s not to say that my experience was a bad one. As far as wedding gown shopping experiences go, I assume that mine was actually a really good one. I had a single hour and a half appointment at David’s Bridal this past weekend, and by the time I walked out the door, I had already placed an order for my wedding gown. I left absolutely thrilled with the success of my trip, and I couldn’t have been more pleased with my chosen gown. And yet my experience wasn’t quite what I had expected. When I walked into David’s Bridal, we had about ten minutes to ourselves before my consultant arrived. During those ten minutes, my mom, sister, and I walked through the racks of dresses, and I was overwhelmed by the sheer amount of white gowns. I knew that they were all unique, and yet, as I perused the racks, I found that one dress seamlessly blended into the next. After walking through an entire row of them, I found that I could no longer identify the difference from dress to dress. They all seemed the same. Before my appointment had even begun, I was already beginning to hyperventilate from the sheer amount of information flooding my mind. As my vision faded to pure white, my consultant finally arrived to save me. We walked out into the main area of the store, where I told her some basic requirements for my wedding dress- style, budget, cloth preferences, etc. With these initial requests in mind, my consultant pulled a few dresses off the racks and then ushered my mom, sister, best friend, and me into the dressing room. With every dress that I tried on, we were able to narrow my likes further. No, I didn’t like this. Oh, but I really like this. So on, and so on. When my consultant didn’t have any more options (this happened after about my fifth dress), she came back with the catalog of wedding gowns. I stood in one of her selections, peering over my mom’s shoulder and pointing out dress styles that I liked. One by one, my consultant pulled them off the rack, and I obediently tried them on. I patiently waited as my family and friend analyzed the dresses. Some we were able to discard immediately; others required more deliberation. And then I reached the last of the gowns that I had selected from the catalog. Without going into much detail (there’s a possibility that Andrew will read this before we get married), it was a gorgeous gown, but not necessarily one that I would have pictured myself in. But I liked it enough to try it on. As I emerged from the dressing room, I searched my mom’s face for her first reaction to the gown, but she was decidedly poker-faced. It wasn’t that she was trying to hide her feelings from me (at least I don’t think that was her intention)- she was simply smiling as I walked out. This had been her reaction to about 85% of the dresses, with the exception of one dress that looked a bit like two dresses sown together at the waist and another that looked like a piece of the skirt had been removed to reveal the layers beneath. The smile was my mom’s stamp of approval, and my sister and best friend seemed to approve as well. Finally, I was able to see the gown for myself, and while it wasn’t “love at first sight,” there was a sense of peace that filled me as I looked at myself in the mirror. Finally, this was a dress that I could see myself walking down the aisle in. This was a dress that I really liked. This could very well be “the dress.” And yet, I tried one more dress on after that. In the end, I found myself drifting back to the last dress, and I realized that there had been a shift in perspective. Whereas before, I had been comparing the dresses to a loose image in my mind, I now found that I was comparing the dresses to this last dress, the dress. And that was when I knew that I had found “the one.” There had been no “wow” moment. I had not known immediately. I didn’t know as soon as I tried it on. In fact, it wasn’t until I tried on another dress that I realized what I had found. That was when I knew. My family and friend knew too. So did the consultant. I tried it on once more, and my mom snapped a few more photos with her phone. And then the consultant asked me the big question: “So, is this the one?” And how did I respond? I said ‘yes’ to the dress. I write this not (only) that I should be able to share my wedding gown shopping experience with you, but also to give you this piece of advice. There is no such thing as “the dress.” It becomes “the dress” when you make it so. You might not know as soon as you see it. You might not even know when you try it on. It might even take you additional trips to other boutiques before you realize the truth: you’ve begun comparing all dresses to one. That one is your dress. You might not find out because of some “wow” moment, but that’s fine. No matter how you find your dress- whether you know the moment you see it or if it takes some time to choose it- you can and should make it yours. It becomes “the one” when you choose it. It becomes “the dress” when you make it yours. But no matter how you find it, your dress shopping journey can only lead you to one place: the altar. And when you get there, your soon-to-be husband will find you to be the most beautiful woman in the world.